The U.S. exported a stunning amount of gold since the turn of the century. As the price of gold surged along with the massive increase in U.S. debt, gold exports jumped to record highs. In 2012 alone, the United States exported nearly 700 metric tons of gold. The total amount of U.S. net gold exports over the past 17 years equaled the combined gold reserves of six high ranking countries. While the U.S. exported nearly 8,000 metric tons (mt) of gold since 2001, it also imported a great deal as well. Thus, we arrive at a “net export” figure by subtracting gold imports from gold exports. During the past 17 years, there were only four years where the U.S. imported more gold than it exported. These net gold import years were in 2004-2005 and 2010-2011 and totaled only 322 mt. 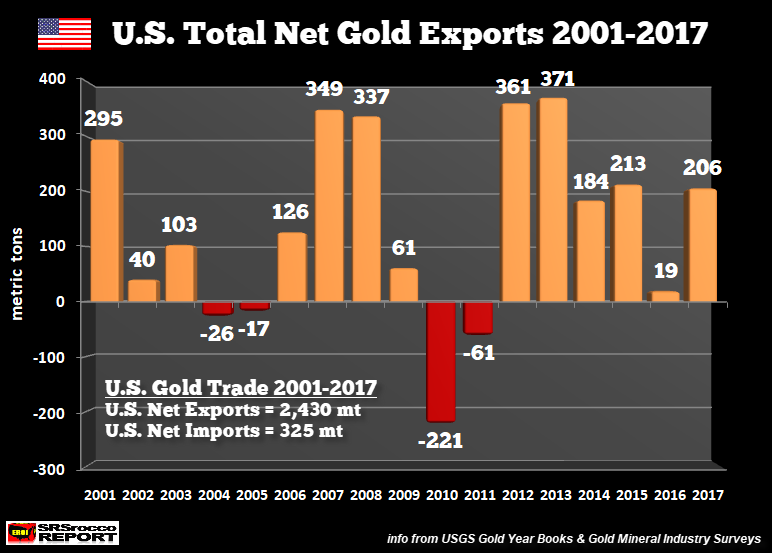 From 2012 to 2017, U.S. net gold exports totaled 1,354 mt or 43.5 million. That’s one heck of a lot of gold. Of course, the United States produces a lot of gold, 210-225 mt annually, however, domestic demand consumes a large percentage of that amount. Now if we compare U.S. net gold exports versus the official reserves at top-ranking countries, the number turns out to be quite large. The combined official gold holdings of the U.K., Saudi Arabia, Portugal, Taiwan, European Central Bank and India of 2,512 mt is about the same amount of U.S. net gold exports (2,430 mt) from 2001 to 2017. Moreover, Italy (2,452 mt) and France (2,436 mt) which rank 4th and 5th respectively in official world gold reserves, are approximately the same amount of U.S. net gold exports during the same period (official gold reserves: source, World Gold Council). The majority of U.S. gold exports were shipped to Switzerland, the U.K., and Hong Kong. These three countries received more than 80% of U.S. gold exports during the 17-year period. When the U.S. Dollar finally loses its world reserve status, Americans are going to wish that they held onto their gold instead of sending it overseas, ending up mostly in China and India.